A 61-year-old-gentleman with an unremarkable past medical history presents with an enlarged right Level II PET+ lymph node. Fine needle aspiration and core biopsy is performed. 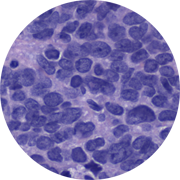 The core demonstrates syncytial aggregates of malignant cells comprised of large round to oval to spindle-shaped nuclei. The nuclear membranes are slightly irregular and the chromatin is fine and mildly hyperchromatic. One to three nucleoli are present. Mitotic figures are readily apparent. Cytoplasm is delicate and with ill-defined borders. Lymphoid tissue is present in the background. Immunostains show that the neoplastic cells are positive for p16, p63, and Ki67 (95%) and negative for chromogranin, synaptophysin, and TTF-1. A diagnosis of metastatic undifferentiated nasopharyngeal carcinoma is assigned.